I want to bake a cake like this. The decorations remind me of the '50s or early '60s. Via Hey Bubbles on Flickr. That's so pretty! And it looks delicious! Mmm, white chocolate! I'm sure I had a cake that looked very similar to that for my 6th or 7th birthday party. 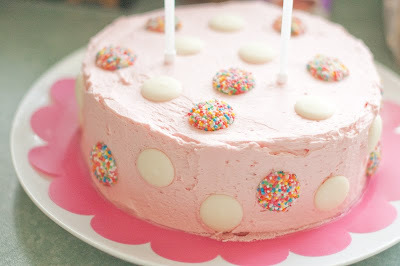 I'm gonna bake some cakes for my birthday this weekend but I don't think they will look as pretty as this one! I'm hungry right away! Cute and delicious!!! Surely wouldn't be hard to do either. Bake it and show us how it goes! that would be a cute birthday cake!! This is adorable and looks like it'd be so yummmy!